This topic describes how to deploy clustered storage spaces by using Storage Spaces and Failover Clustering in Windows Server 2012. Together, these technologies provide a resilient, highly available, and cost-efficient solution that you can scale from simple deployments to the needs of a large datacenter. You can build a failover cluster for your physical workloads or for virtual workloads that are available through the Hyper-V role. To deploy Storage Spaces with shared SAS enclosures on Windows Server 2012 R2, instead see the updated guide: Deploy a Storage Spaces cluster on Windows Server 2012 R2. The basic building block of a clustered storage spaces deployment is a small collection of servers, typically two to four, and a set of shared Serial Attached SCSI (SAS) just-a-bunch-of-disks (JBOD) enclosures. The JBOD enclosures should be connected to all the servers, where each server has redundant paths to all the disks in each JBOD enclosure. The following figure shows an example of the basic building block. By using Cluster Shared Volumes (CSVs), you can unify storage access into a single namespace for ease of management. A common namespace folder is created at the path C:\ClusterStorage\ with all the CSVs in the failover cluster. All cluster nodes can access a CSV at the same time, regardless of the number of servers, the number of JBOD enclosures, or the number of provisioned virtual disks. This unified namespace enables highly available workloads to transparently fail over to another server if a server failure occurs. It also enables you to easily take a server offline for maintenance. Physical disk failures When you deploy a clustered storage space, protection against physical disk failures is provided by creating storage spaces with the mirror or parity resiliency types. Additionally, mirror spaces use dirty region tracking (DRT) to track modifications to the disks in the pool. When the system resumes from a power fault or a hard reset event and the spaces are brought back online, DRT makes disks in the pool consistent with each other. Data access failures If you have redundancy at all levels, you can protect against failed components, such as a failed cable from the enclosure to the server, a failed SAS adapter, power faults or failure of a JBOD backplane. For example, in an enterprise deployment, you should have redundant SAS adapters, SAS I/O modules, and power supplies. To protect against complete disk enclosure failure, you can use redundant JBOD enclosures. Data corruptions and volume unavailability Both the NTFS file system and the Resilient File System (ReFS) help protect against corruption. For NTFS, improvements to the Chkdsk tool in Windows Server 2012 can greatly improve availability. For more information, see NTFS Health and Chkdsk. For more information about ReFS, see Resilient File System Overview. Server node failures Through the Failover Clustering feature, you can provide high availability for the underlying storage and workloads. This helps protect against server failure and enables you to take a server offline for maintenance without service interruption. You cannot use a storage space to host the Windows system drive. Configure storage spaces in File and Storage Services before you create the failover cluster, and then add the storage spaces as eligible storage during failover cluster creation. If you want to use this method, follow steps 1 through 4 in this topic. Optionally, you can complete step 6 to add the volume to a CSV. Create a clustered storage space by using Failover Cluster Manager after you create a failover cluster. If you want to use this method, skip step 3 in this topic. Optionally, you can complete step 6 to add the volume to a CSV. To support clustered storage spaces, your configuration must meet the prerequisites that are outlined in the following table. Operating system Storage Spaces and the Failover Clustering feature are supported in all editions of Windows Server 2012 R2 and Windows Server 2012. This includes Server Core installations. Disk bus type The disk bus type must be SAS. We recommend dual-port SAS drives for redundancy. Storage Spaces does not support iSCSI and Fibre Channel controllers. Resiliency type The simple, mirror, and parity resiliency types are supported for a failover cluster though the parity resiliency type is not supported on failover clusters running Windows Server 2012. Warning: Do not use a simple space to host irreplaceable data. - For two-way mirroring on failover clusters, you must have at least three physical disks. - For three-way mirroring on failover clusters, you must have at least five physical disks in the storage pool. - The disks must be blank and not formatted. Do not create volumes. - All disks must be at least 4 GB. - The physical disks that are used for a clustered storage pool must be dedicated to that pool. You cannot add startup disks. HBA considerations We recommend that you use simple host bus adapters (HBAs) that do not support RAID functionality. If RAID capable, HBAs must be in non-RAID mode with all RAID functionality disabled. Adapters must not abstract the physical disks, cache data, or obscure any attached devices. This includes enclosure services that are provided by attached JBOD devices. Storage Spaces is compatible only with HBAs where you can completely disable all RAID functionality. JBOD enclosures For full Storage Spaces functionality, use a certified JBOD. For a list of certified devices, see the Windows Server Catalog. Disks must provide persistent reservations and pass cluster validation. If the EnclosureNumber and SlotNumber fields have values, this indicates that the enclosure supports these features. With highly available storage, where there are multiple paths from the physical disks in the storage enclosure to the server, you must use multipath I/O (MPIO) software. The Windows Multipath I/O feature combines the multiple physical paths to physical disks as a single logical path that is used for data access. Also, it provides resiliency to a failure of a physical path and load balancing across physical paths. For multipath support, you must enable MPIO on each server that can access the shared storage. In Server Manager, click the server on which you want to install MPIO. On the Select features page of the Add Roles and Features Wizard, select the Multipath I/O check box. Complete the Add Roles and Features Wizard. Repeat this procedure for each server that you want to add as a failover cluster node. The following example installs the MPIO feature on a server that is named Server1. Before you create the failover cluster, verify that all servers that you want to add as cluster nodes can see the shared disks. You can do this by using Server Manager, the Disk Management tool, or through Windows PowerShell. To verify from one console that all servers can see the shared disks, make sure that you add all computers that you want to add as cluster nodes to Server Manager. In Server Manager, click File and Storage Services, and then under Volumes, click Disks. If you want to create storage spaces before you create the failover cluster, the disks do not have to be online or initialized. The disks must not be partitioned. If you want to create a clustered storage space by using Failover Cluster Manager after you create a failover cluster, the disks must be online and initialized without partitions. The following example lists the disks that are visible to the server. This includes their online or offline status and excludes the system disks. The following example lists the disks that are available for the storage pool, where the bus type is SAS. The following example initializes the disks that you specify. You can obtain the disk numbers from the output of the Get-Disk cmdlet. This step shows how to create storage spaces before you create the failover cluster by using the shared physical disks. When you create the failover cluster, if you designate that you want to add all eligible storage, the storage pools are automatically added as clustered storage pools with the associated virtual disks and volumes. Skip this step if you want to create a clustered storage space by using Failover Cluster Manager after you create a failover cluster. Verify that the disks meet the requirements that are outlined in the Prerequisites section of this topic. Only SAS disks are supported in a clustered storage space. When you create a storage pool, you must select at least three physical disks. If you want to use the mirror resiliency type to protect against disk failure, make sure that you select at least three physical disks for a two-way mirror or at least five physical disks for a three-way mirror. Specify Fixed as the provisioning type. If you have multiple JBOD enclosures, and you want Storage Spaces to try to construct a storage space across them to help protect against complete JBOD failure, you must use Windows PowerShell to create virtual disks. For example, the following cmdlet shows how to create a virtual disk with the IsEnclosureAware $True parameter. When you create volumes, you must format the volumes with NTFS if you want to add the volumes to CSVs on servers running Windows Server 2012. The Deploy Storage Spaces on a Stand-Alone Server topic includes the associated Windows PowerShell examples. This step shows how to install a failover cluster that you can use to host clustered storage spaces. For more information about failover clustering, see Failover Clustering Overview. Install the Failover Clustering feature on each node. For more information, see Install or Uninstall Roles, Role Services, or Features. On one of the nodes, open Failover Cluster Manager, and then under Management, click Validate Configuration to validate the cluster. When you run the validation tests, make sure that you include the storage tests. If you have already created storage spaces in File and Storage Services, on the Confirmation page of the Create Cluster Wizard, verify that the Add all eligible storage to the cluster check box is selected. If you have not yet created any storage spaces, make sure that you do not add the physical disks as cluster disks. Therefore, on the Confirmation page of the Create Cluster Wizard, clear the Add all eligible storage to the cluster check box. In Failover Cluster Manager, expand ClusterName, expand Storage, and then click Pools. In the Pools pane, verify that any storage pools that you created in File and Storage Services are listed. For detailed information, click a storage pool. In the results pane, you can view information on the Summary, Virtual Disks, or the Physical Disks tabs. To verify that virtual disks were added as cluster disks, under the Storage node, click Disks. To add a cluster disk to a CSV, continue to Step 6: (optional) Add a cluster disk to a CSV. To create clustered storage spaces through Failover Cluster Manager, continue to step 5. The following example installs the Failover Clustering feature. The following example runs all cluster validation tests on computers that are named Server1 and Server2. The Test-Cluster cmdlet outputs the results to a log file in the current working directory, for example C:\Users<EM>username\AppData\Local\Temp. The following example creates a failover cluster that is named MyCluster with nodes Server1 and Server2, assigns the static IP address 192.168.1.12, and adds all eligible storage to the failover cluster. If you have already created storage spaces in File and Storage Services, add all eligible storage. The following example creates the same failover cluster as in the previous example, but it does not add eligible storage to the failover cluster. If you have not yet created any storage spaces, make sure that you do not add eligible storage. If you have an existing failover cluster, you can create clustered storage spaces through Failover Cluster Manager. For an existing failover cluster, you can also create storage spaces in File and Storage Services, and then add the storage space in Failover Cluster Manager. To do this, in Failover Cluster Manager, expand ClusterName, expand Storage, right-click Pools, and then click Add Storage Pool. In the Add Pools to a Cluster dialog box, select the check box next to the pool, and then click OK. To add virtual disks and associated volumes, right-click Disks, and then click Add Disk. In the Add Disks to a Cluster dialog box, select the check box next to each cluster disk that you want to add, and then click OK.
To have Storage Spaces try to construct a storage space across multiple supported JBOD enclosures, you must use Windows PowerShell to create the virtual disk by using the IsEnclosure $True parameter. For more information, see the second example in the Windows PowerShell equivalent commands section immediately below. In Failover Cluster Manager, expand ClusterName, and then expand Storage. Right-click Pools, and then click New Storage Pool. The New Storage Pool Wizard opens. On the Specify a storage pool name and subsystem page, enter a name and optional description for the storage pool, select the group of available physical disks that you want to use, and then click Next. In the Available to column, verify that the cluster name is listed. Select the check box next to each physical disk that you want to include in the storage pool. For a failover cluster, you must select at least three physical disks. If you want to designate one or more disks as hot spares, under Allocation, click the drop-down arrow, and then click Hot Spare. On the Confirm selections page, verify that the settings are correct, and then click Create. On the View results page, verify that all tasks are completed, select the Create a virtual disk when this wizard closes check box, and then click Close. The New Virtual Disk Wizard opens. On the Before you begin page of the New Virtual Disk Wizard, click Next. On the Select the storage pool page, click the desired storage pool, and then click Next. On the Specify the virtual disk name page, enter a name and optional description for the virtual disk, and then click Next. On the Select the storage layout page, click the desired layout, and then click Next. For a failover cluster, you can select Simple, Mirror, or Parity, though Parity isn’t supported on Windows Server 2012. For resiliency to recover from disk failure, you must select Mirror or Parity. To specify a size, click Specify size, enter a value in the Virtual disk size box, and then select the units (MB, GB or TB). If you use a mirror storage layout, the virtual disk uses more free space than the size that you specify. To avoid a potential error where the size of the volume exceeds the storage pool free space, you can select the Create the largest virtual disk possible, up to the specified size check box. To create a virtual disk that uses the maximum capacity of the storage pool, click Maximum size. On the View results page, verify that all tasks completed, make sure that the Create a volume when this wizard closes check box is selected, and then click Close. By default, the Create a volume when this wizard closes check box is selected. If you clear the check box, you must create a volume through File and Storage Services in Server Manager or through Windows PowerShell. You cannot create the volume through Failover Cluster Manager. On the Before you begin page of the New Volume Wizard, click Next. On the Select the server and disk page, do the following, and then click Next. In the Server area, click the failover cluster on which you want to provision the volume. In the Disk area, click the virtual disk on which you want to create the volume. On the Specify the size of the volume page, enter a volume size, specify the units (MB, GB, or TB), and then click Next. On the Assign to a drive letter or folder page, configure the desired option, and then click Next. On the Select file system settings page, do the following, and then click Next. In the File system list, click NTFS or ReFS. If you want to add the virtual disk to a CSV, you must use NTFS. In Windows Server 2012, ReFS does not support CSVs, data deduplication, or File Server Resource Manager (FSRM). In the Allocation unit size list, either leave the setting at Default or set the allocation unit size. For more information about allocation unit size, see Default cluster size for NTFS, FAT, and exFAT. Optionally, in the Volume label box, enter a volume label name, for example HR Data. On the View results page, verify that all tasks completed, and then click Close. In the Pools pane, verify that the storage pool is listed. For more detailed information, click the storage pool. In the results pane, you can view information on the Summary, Virtual Disks, or the Physical Disks tabs. To verify that virtual disks were added as cluster disks, under the Storage node, click Disks. Make sure that cluster disks are listed, for example, Cluster Disk 1. Click a cluster disk, and then view the information in the results pane. The results pane shows information such as the virtual disk name, the health, the resiliency type, and volume information. You can also view the volumes on the Volumes page of File and Storage Services in Server Manager. Or, in Windows Explorer, you can view the volumes on the node that owns the cluster disk. To add a cluster disk to a CSV, continue to Step 6: (optional) Add a cluster disk to a CSV. 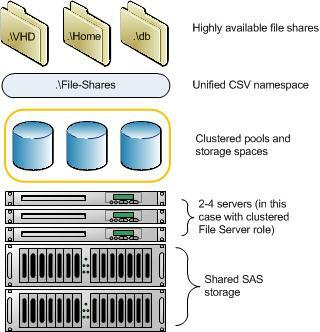 The following example creates a storage pool StoragePool1 that uses all available SAS disks. It also sets the fixed provisioning type as the default. $stsubsys = Get-StorageSubsystem -FriendlyName "Clustered Storage Spaces*"
The following example sequence of cmdlets creates a storage pool StoragePool1 that uses three physical disks: PhysicalDisk1, PhysicalDisk2, and PhysicalDisk3. It also sets the fixed provisioning type as the default. The following example adds the hot spare disk that you select to StoragePool1. The following example creates a 10 GB virtual disk VirtualDisk1 with the mirror resiliency type in the storage pool StoragePool1. The following example is the same as the previous example, but it adds the IsEnclosureAware $True parameter. Specify this parameter if you want Storage Spaces to try to construct a mirror across multiple supported JBOD enclosures. The following example sequence of cmdlets initializes the virtual disk that you created in the previous step, creates a partition with the default partition style of GUID partition table (GPT), assigns a drive letter, and then formats the volume with the default of NTFS. The following example sequence of cmdlets adds the virtual disk VirtualDisk1 to the failover cluster. This step shows how to add a cluster disk to a CSV. By doing this, the clustered storage is available across a uniform namespace on all nodes. By default, this namespace is C:\ClusterStorage, where C:\ represents the system disk. In Failover Cluster Manager, expand ClusterName, expand Storage, and then click Disks. Right-click a cluster disk, and then click Add to Cluster Shared Volumes. The Assigned To column changes to Cluster Shared Volume. The following example adds the cluster disk Cluster Disk 1 to a CSV on the local failover cluster.